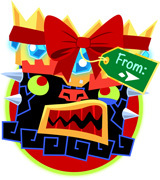 We’ve squeezed in an iOS price drop before the App Store’s annual holiday lockdown. The Tilt to Live Tilty-Tilt Boom Boom Bundle will be available throughout the holiday season for just $3.99 USD (normally $5.99). So for a buck more than it costs for one Tilt to Live, you can grab all three! Would make a handsome gift for anyone unwrapping a new iDevice in the near future. Wink. Alex is still locked away in his laboratory working on the Outwitters Android port (which is being discussed in more detail over here). That project doesn’t require any new artwork, so I’m left to my own devices for a while longer. To date, I have 7 different turn-based multiplayer games working as paper prototypes in Adobe Illustrator. Alex shifts his focus to prototyping in January, so we’re on track to have a good, large pool of projects to choose from. I absolutely cannot wait. Keep up the work! Are we back to Friday updates?